Well, as you can see, my “monthly” research updates are a little bit behind and this post is extra long. It seems like with all the work to be done outdoors and out of town, it’s been hard to sit down to write about it all. But as I look back at June and July it’s exciting to remember all that has happened. 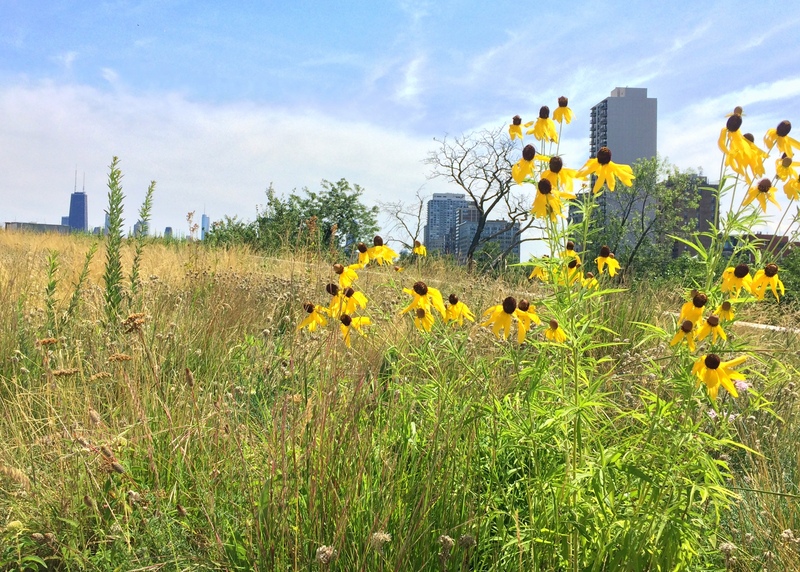 Ratibida pinnata (gray-headed coneflower) blooms beautifully in one of my green roof plots. 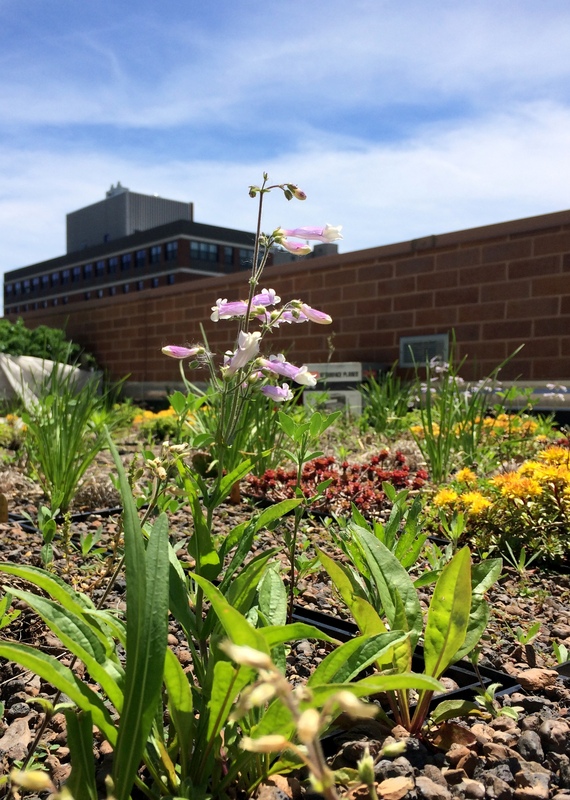 First, I am happy to say that an article I wrote about biodiversity on green roofs was published in Wild Seed Magazine, a publication from the Maine-based non-profit Wild Seed Project. I won’t say too much about the article, other than you should click HERE to read it and if you should click on the link above if you want to get a copy of the whole magazine (which includes an article from the amazing naturalist Doug Tallamy and is really good). 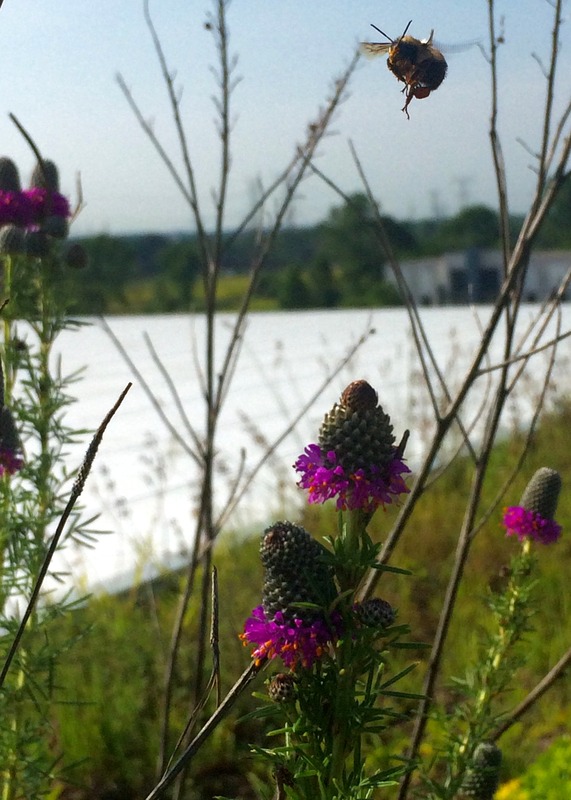 The Dalea purpurea (purple prairie clover) was blooming on the green roofs in June and attracting pollinators! 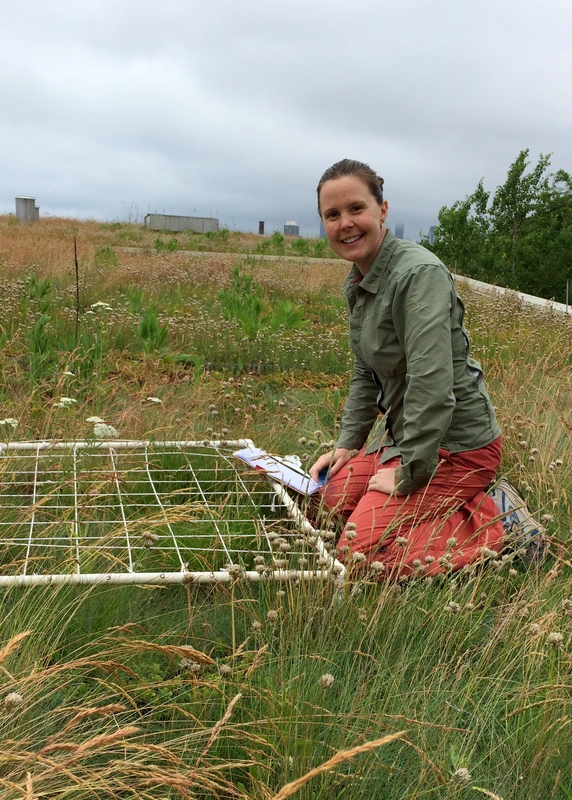 As far as research goes, June started out with data collection on the green roofs. I’m continuing to measure the plants in the prairie mixes that I planted back in 2012 and at the beginning of the summer, things looked a little sparse but promising. After a pretty rainy summer, some of the same plots are actually pretty lush and there are many species of plants that are flowering in beautiful displays of yellow, white, and purple flowers. It’s impossible to capture them all with my cell phone’s camera, but believe me when I tell you that they are lots of pollinators coming to visit my plants too! When I’m back to more indoor work in the fall I’ll analyze the data to look for significant patterns. 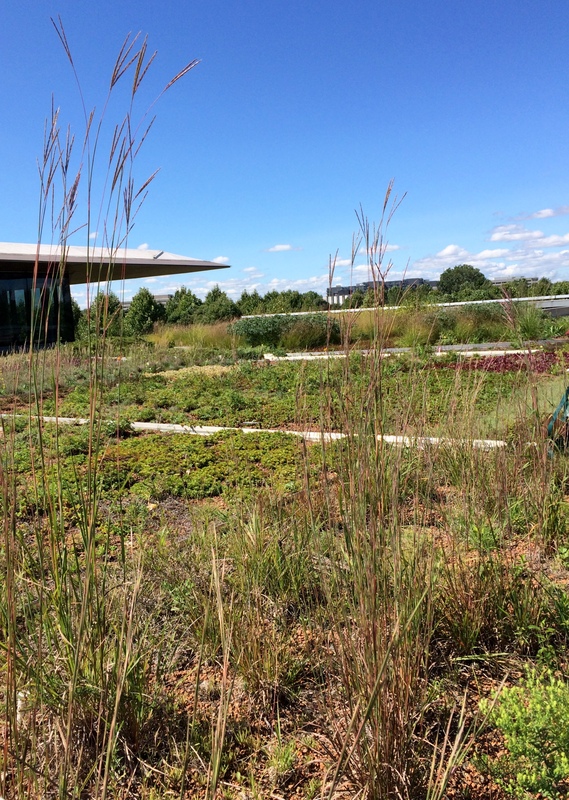 So far, it looks like the species from the prairies that are most similar to green roofs are the ones that are growing the best. 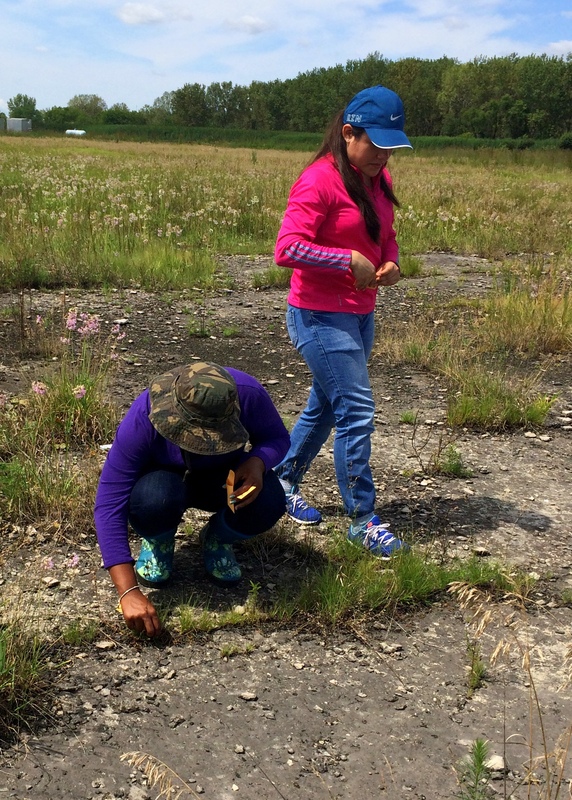 It’s really exciting for me to know that when I stop collecting the data for this experiment, there will be some little prairies on the green roofs for years to come. I’m continuing to measure the amount of water that the different plant combinations capture and hold throughout the day. 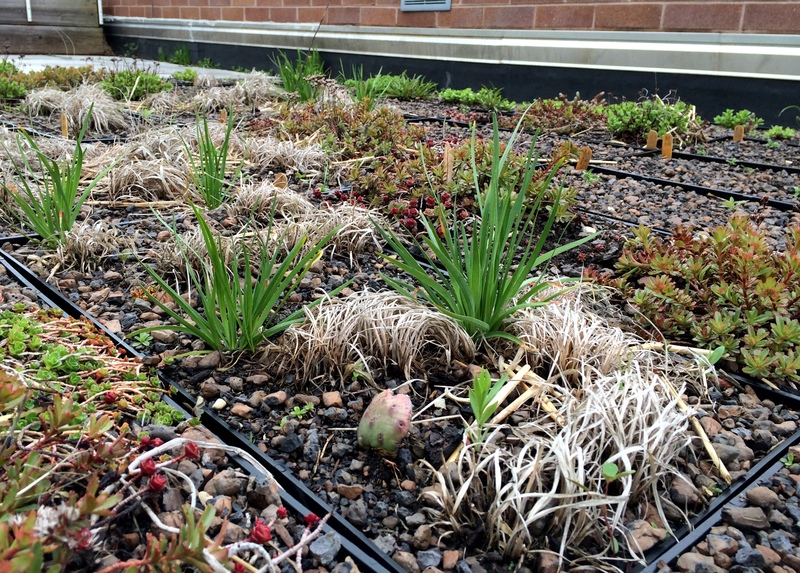 I continue to measure the growth of the plants in my green roof prairie plots that I originally planted back in 2012. 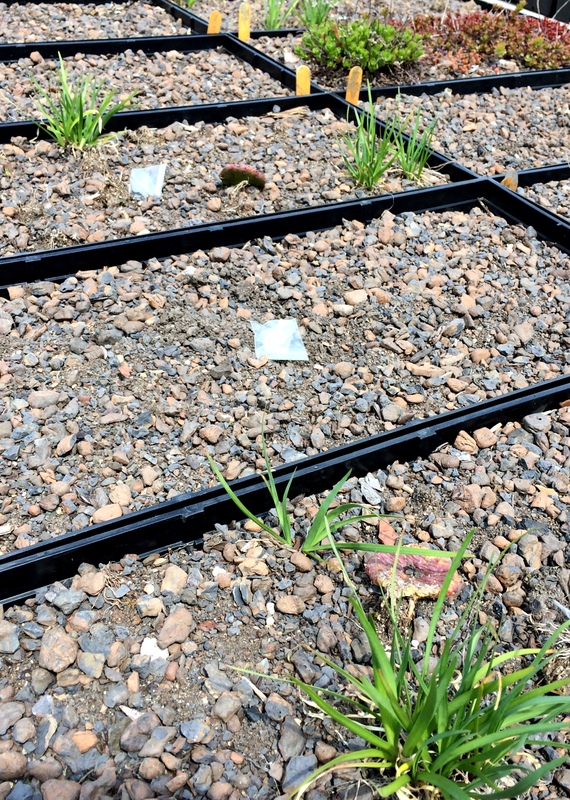 My experiment measuring water capture continues as does my collection of weeds from the green roof trays to determine how good the prairie plants are at resisting weeds compared to succulent plants. 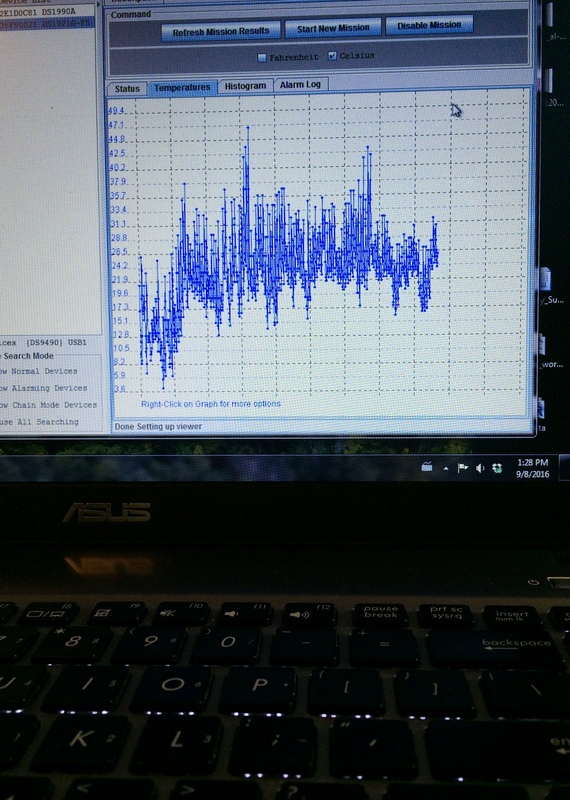 Everything is going well with those experiments except for the fact that a surprise thunderstorm messed up some of my data and I have to do one part of the experiment over again. I’m not happy about that, but that’s just how botanical research goes sometimes. I’ve got my fingers crossed for some rain-free days in early August. Weighing the weeds continues. So far it looks like the succulent Sedum plants are the best at preventing weeds. 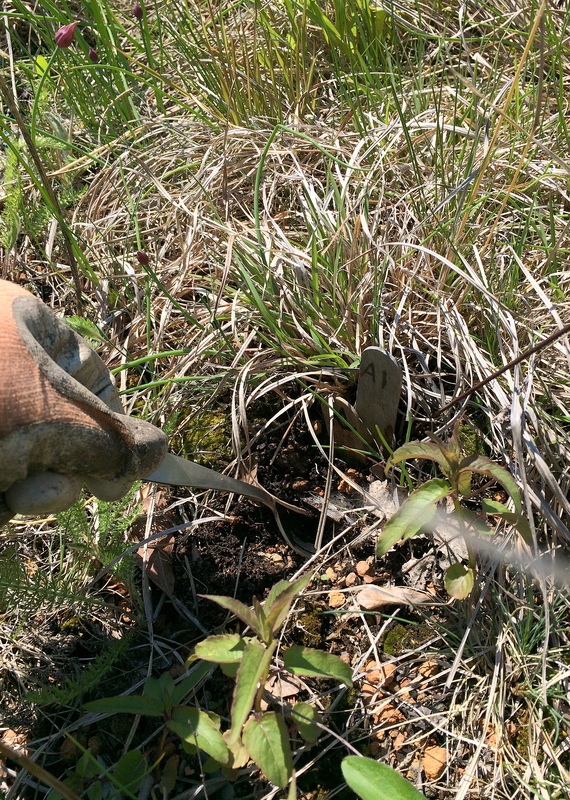 Back to the ground – I finally found the Penstemon plants I was looking for in the shortgrass prairies. It’s fun to go back to the sites that I’m trying to replicate on the roof and appreciate how special these habitats are. 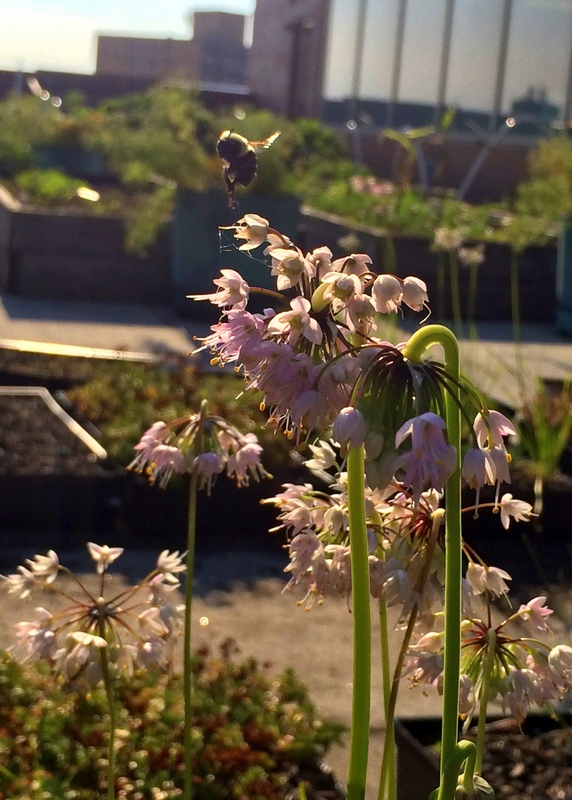 Pollinators are visiting my plants on the green roofs! It’s exciting to see evidence of the ecological relationships that I was hoping to support. 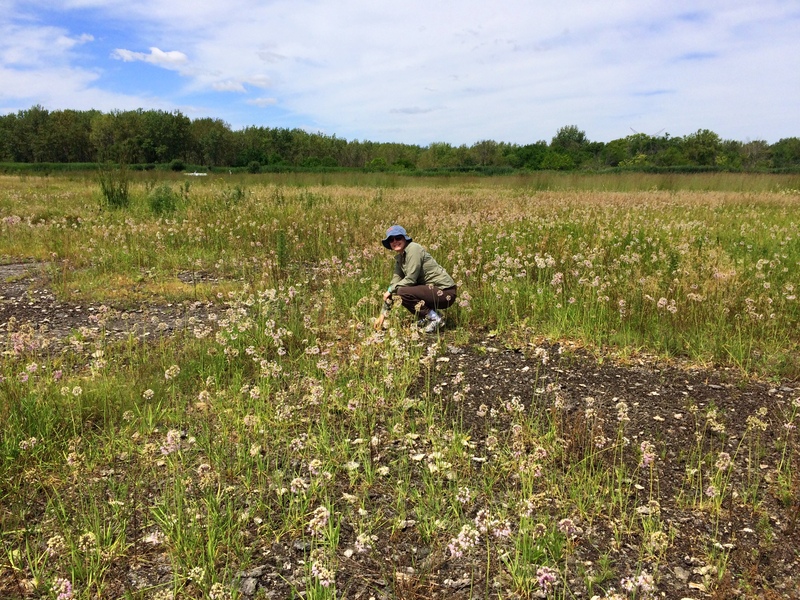 In addition to the green roofs, I also went to a couple prairie remnants southwest of Chicago to collect some plant tissue. 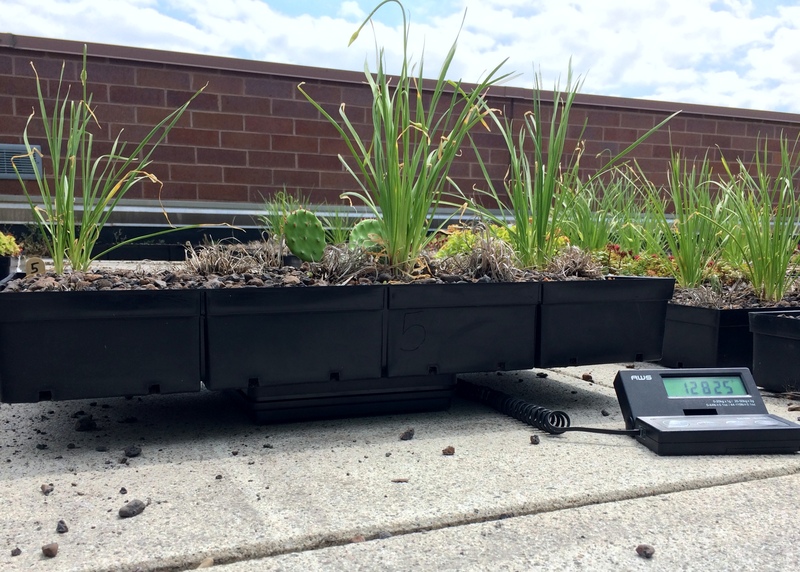 I’ve been putting my lab work on pause for the summer, but if you remember, one of my experiments is to measure pollen movement between green roofs using a paternity study. Well, I’m finding that it’s really hard to distinguish one “dad” plant from another because the dads have very similar DNA. I think this is because the nursery where I got the experimental plants wasn’t using a diverse mix of parental plants but I want to make sure that the plants you’d find in nature would actually have more diversity in their DNA. 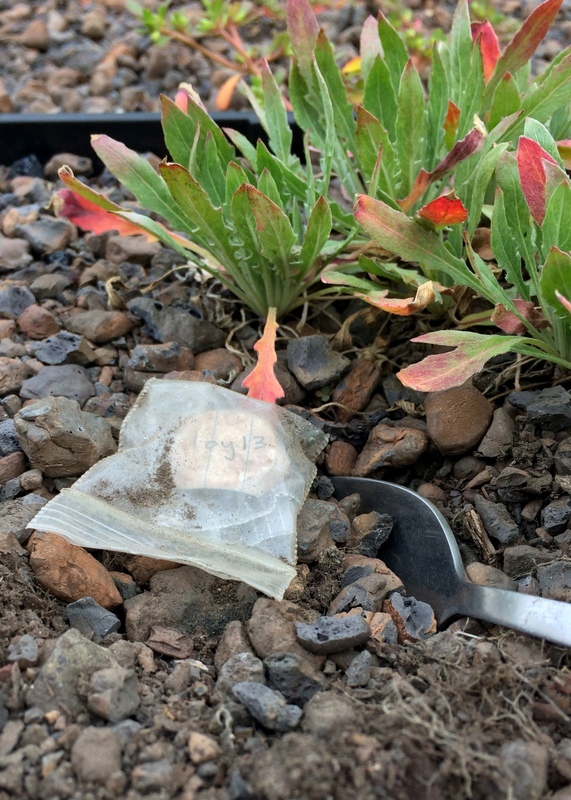 To do this, I need DNA from plants in their natural habitat – and this is what led me to collect leaves from the shortgrass prairies on a steamy Friday in June. I was hoping to find three whole fields full of my target species of Penstemon plants but, after hours of searching, I only found two small patches. For now, I’ve collected the leaf tissue and it’s drying in the lab. I’ll get back to that when it’s time to get back to the lab in the fall. 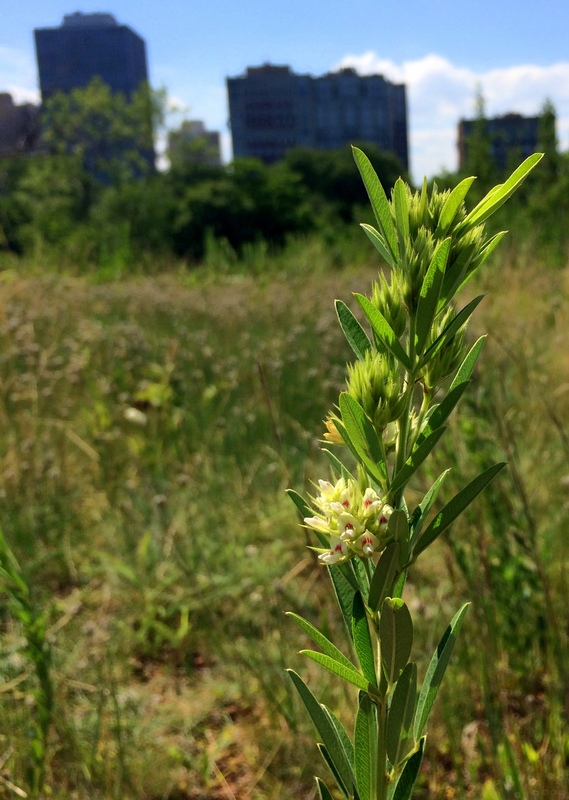 Lespedeza capitata (roundhead bushclover) blooms beautifully in one of my plots on a green roof. It’s actually hard to believe that I was able to collect so many data when I look at all the times I was out of town, talking about research rather than actually conducting it. But through these experiences, I met a lot of wonderful people that are also interested in plant and animal conservation, urban ecology, and science education & communication – my favorite things! At the beginning of June, I was thrilled to be selected as a participant in ComSciCon in Cambridge, MA. This is a graduate student-run conference for other graduate students in science who are interested in engaging with non-scientific audiences. The fellow attendees I met are involved in some amazing endeavors, including documentary filmmaking, graphic design, afterschool programs, and policy advocacy. I could go on for many paragraphs about how awesome these folks were, but I’ll just summarize by saying that I was truly inspired. I started writing a piece about green roofs to be submitted to a children’s magazine while I was there and I’m hoping to get it published this year – stay tuned. After my trip to the East coast, I headed out west to Colorado Spring to participate as a botanist mentor in a workshop called Digging Deeper. As a mentor, I got to meet high school teachers that teach their students about plants together with plant scientists in a program called Planting Science. 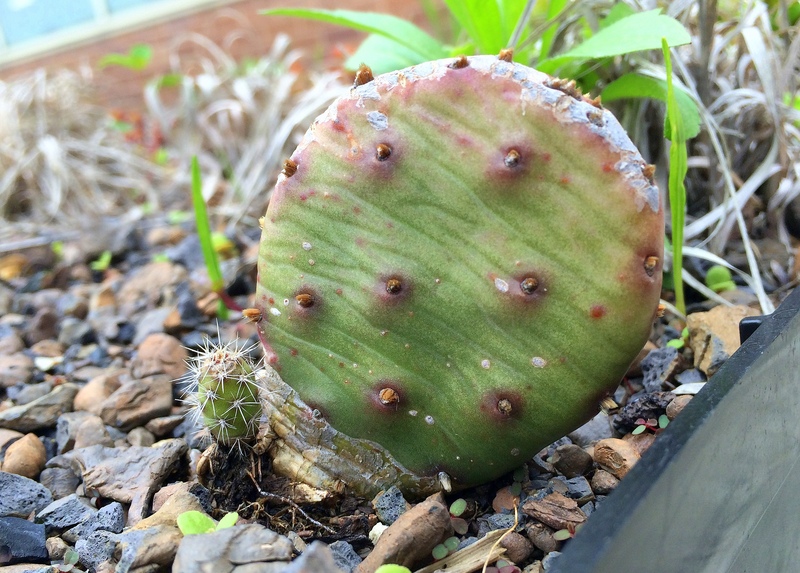 As a previous high school science teacher and current scientist, it was really fun to try and figure out the best ways to teach teenagers about plants in an exciting and engaging way. 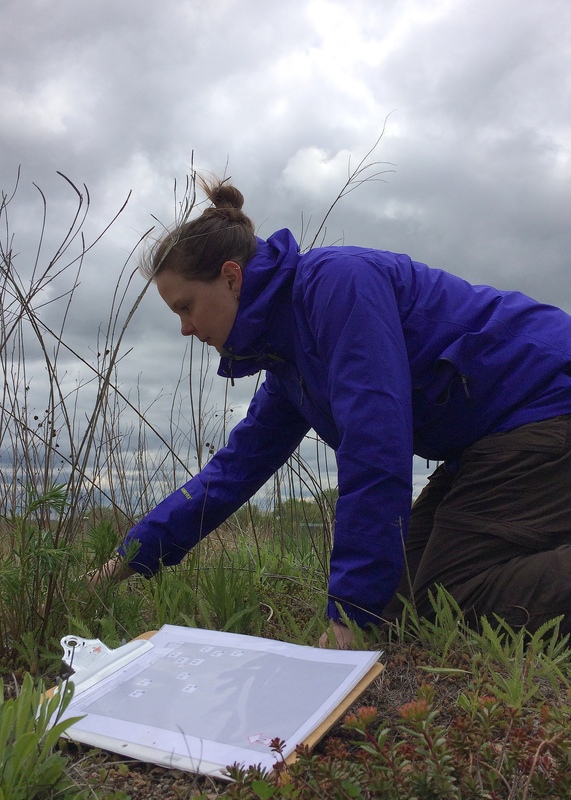 In the fall, I’ll be a mentor to a couple student groups and through video conferences and email messages, we’ll help them design their own experiments to learn about botany – how cool is that? 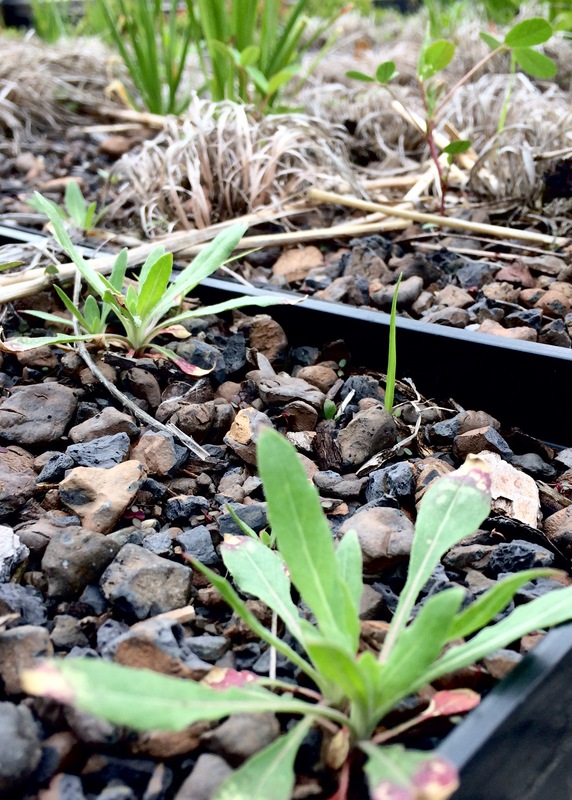 A spontaneous Penstemon plant (the one I’m studying in a different experiment) has germinated and flowered in my experimental green roof trays. I’m glad to see that this native species does so well on green roofs. I had a couple more trips a little closer to home too. 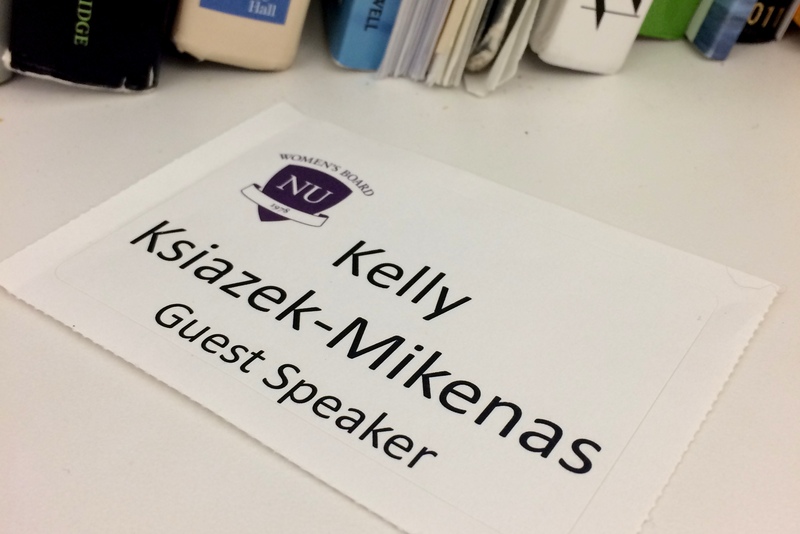 The first one was to Michigan to share my research and meet the new cohort of Northwestern University Presidential Fellows. Wow. More amazing people doing some fascinating research from applications of nanofluids and deciphering the genetic code to impacts of affirmative action on hiring practices in the NFL. The second trip was to Wisconsin to give a presentation at the North American Congress of the Society for Conservation Biology. 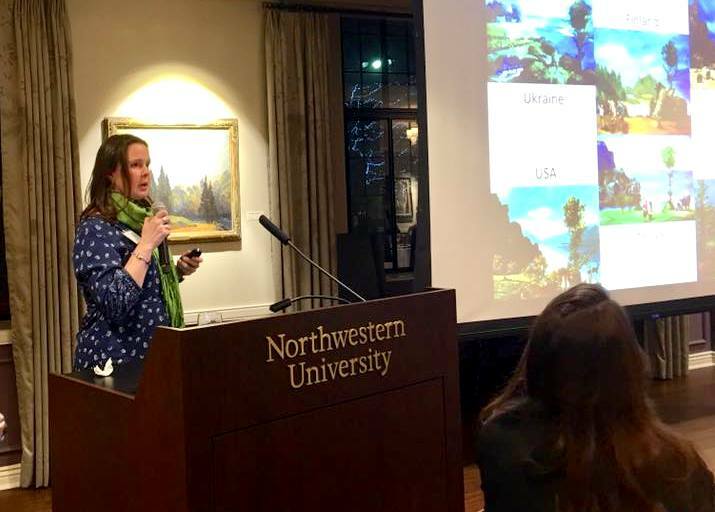 I’m pleased that my presentation about my green roof research was well received and I even got to meet some other professional from the Chicago area that work with trees, wildlife, and the human-nature connection. As I finish the last year of data collection for my dissertation, it’s really helpful to start thinking more about the broad applications of my research and how the things I’ve learned so far might be applied to other fields when graduate school is complete. As a final note, in addition to the research and trips, I also got married in July! Did you notice the new name of the site? I may have a new name but the research is still pretty much the same – I don’t think the plants noticed at all! Up next month: Field work, lab work, data analysis, writing, and even maybe a TV appearance! Winter = writing & lab work. After a few years as a botanical researcher I’m beginning to really understand this seasonal work pattern. So that’s what my January looked like. I spent time making revisions to a research report that I’ve been working on for a while now. This particular report keeps getting better little by little but it is quite a process to take years’ worth of work and write a technical yet brief summary of what it all means and why it all matters. It’s getting there! 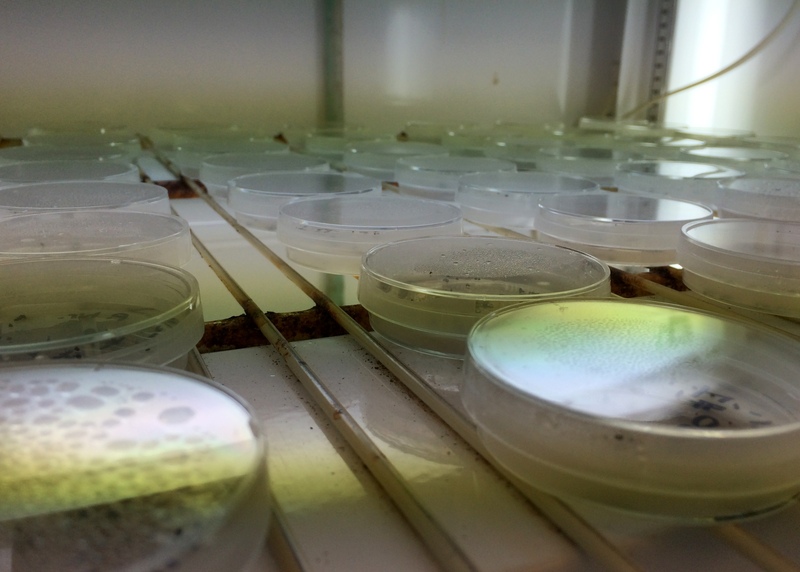 Tiny seeds on agar plates experience simulated spring in an incubator. Lab work has also taken on some different forms and was in full swing in January. In one part of the lab, I washed soil off of the roots of weeds collected from my green roof plots. 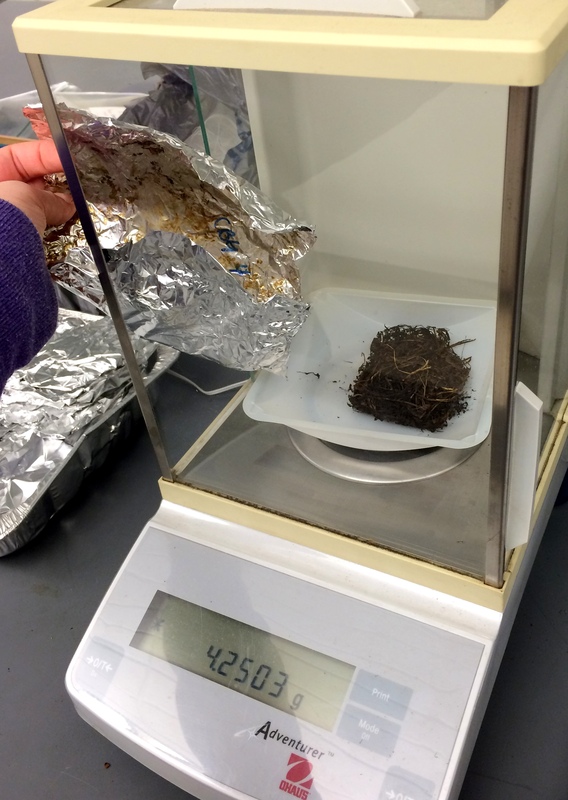 The clean weeds were then dried in an oven and weighed to compare how much weedy plant tissue (called “biomass”) grows in traditional succulent green roofs compared to my prairie-style green roofs. In another part of the lab, I continued to extract DNA from some tiny plant seedlings for a different experiment. 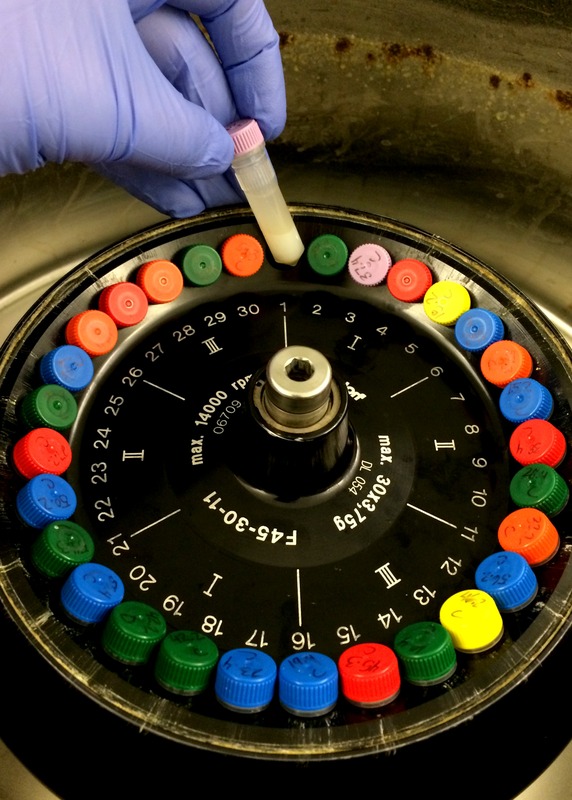 This DNA will later be used to measure how pollen moves between green roofs. I use this computer hooked up to a fancy machine to determine if my DNA primers are working to make lots of copies of the DNA from my plant seedlings. In a different part of the lab, I took some of my seeds already set out on agar plates from a refrigerator where they were experiencing simulated winter and moved them to an incubator where they are now experiencing simulated spring. I’ll later get all of their DNA too. 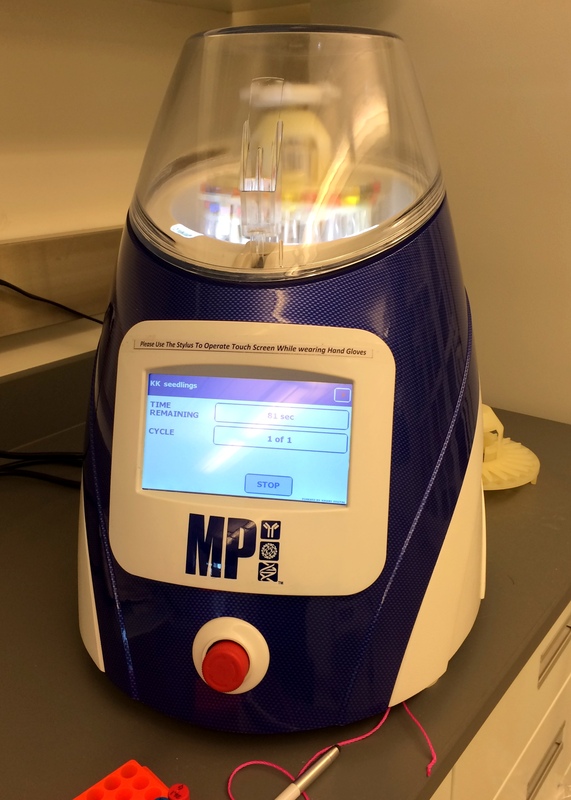 And in still another part of the lab, I continued to work with something called “primers” which are used to help make many copies of small quantities of DNA. I know what you must be thinking: “Just how big is this lab?” Luckily, pretty big! 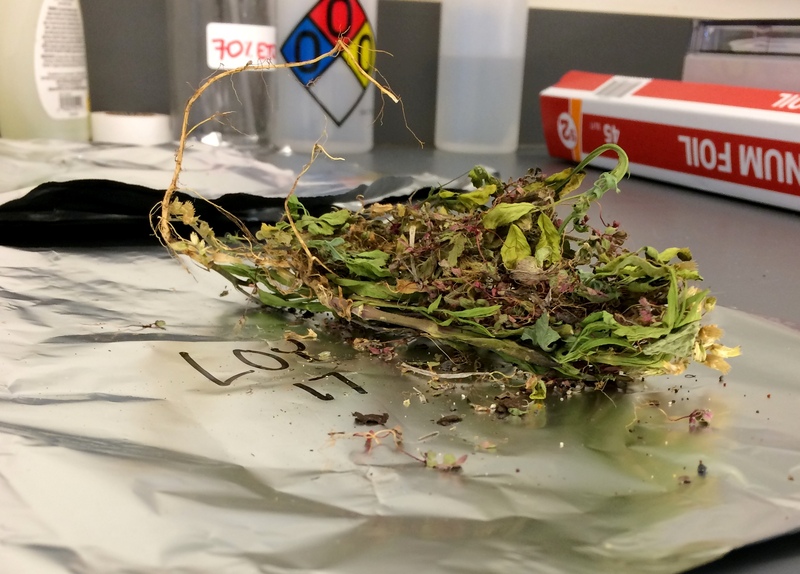 I weigh the dried plant tissue to determine how “weedy” my different treatments are. Aside from the writing and lab work, this month I also got to be in a research-related mini photoshoot of sorts. Remember that children’s activity book about green roofs that I wrote and published last year? Well, the Chicago Botanic Garden is going to be featuring the book in a small article published in their quarterly magazine. I got to feel like a celebrity for a few minutes while I got my picture taken for the article. Of course I’ll share the article on the blog when it comes out – maybe as soon as next month! Smile! 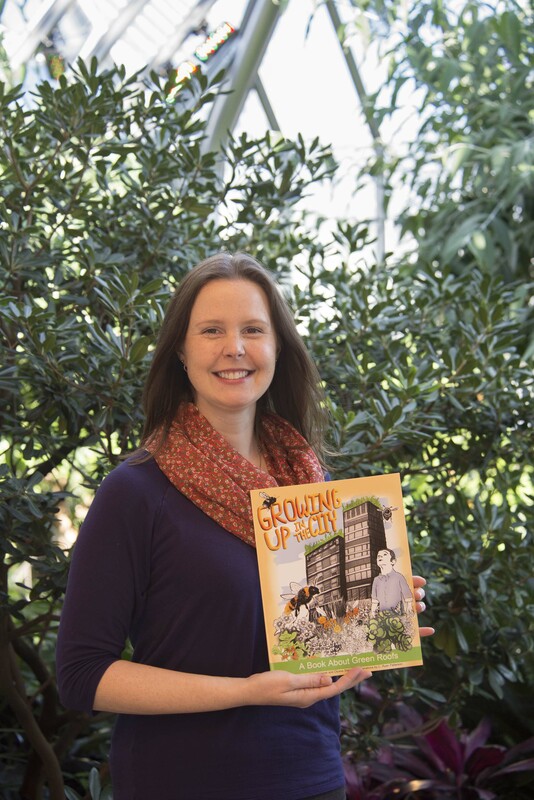 I had fun participating in a mini photo-shoot related to my green roof activity book. And finally, in case you’re interested in the more technical side of some of the research I’ve worked on in the past, my “Publications” page has been updated with downloadable full text versions of many of my research papers. 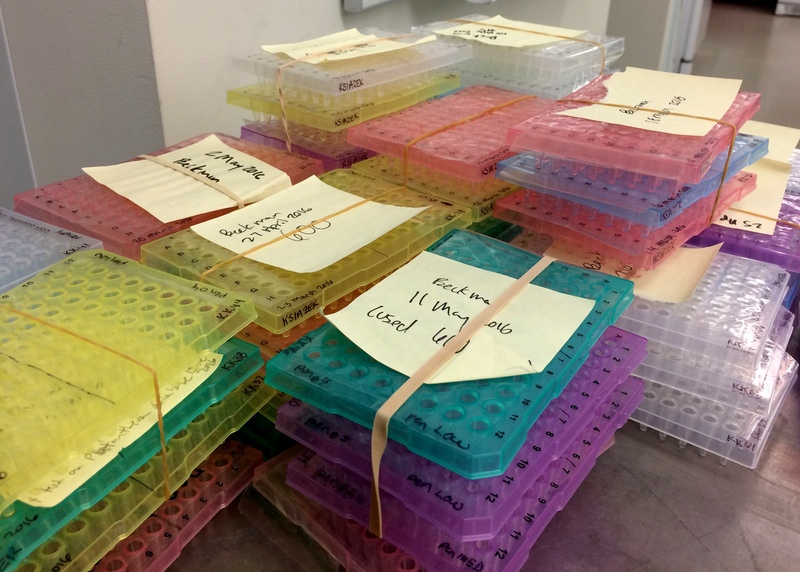 Once again, August was a busy month, filled with field work, lab work and even a conference! It’s fun to look back and see what I was able to accomplish. 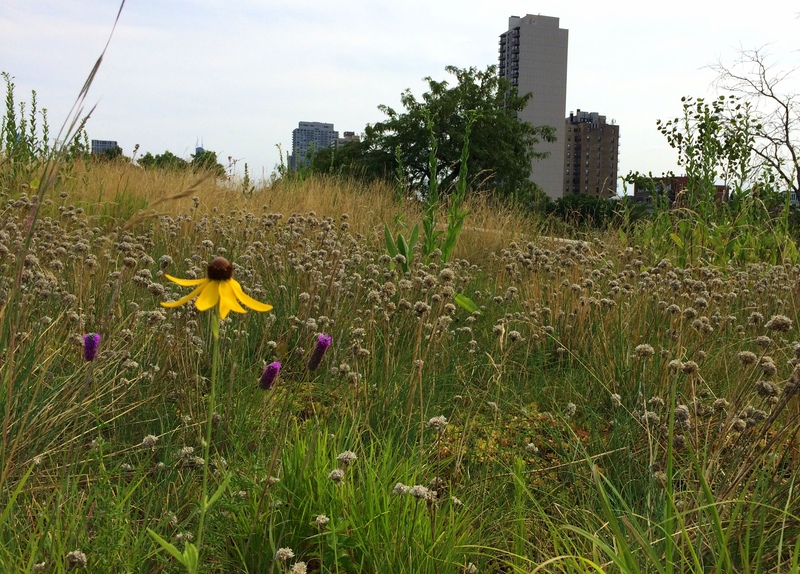 One lonely pinnate prairie coneflower blooms in my green roof prairie plot. It’s trying to attract some pollinators – go little coneflower, go! 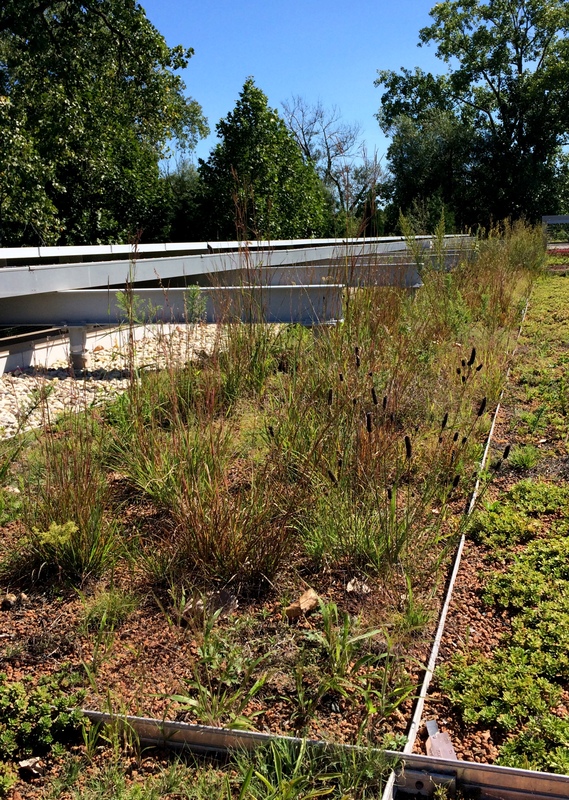 The month started with completion of the vegetation surveys that I was conducting on 3 of the green roofs in the Chicago area. 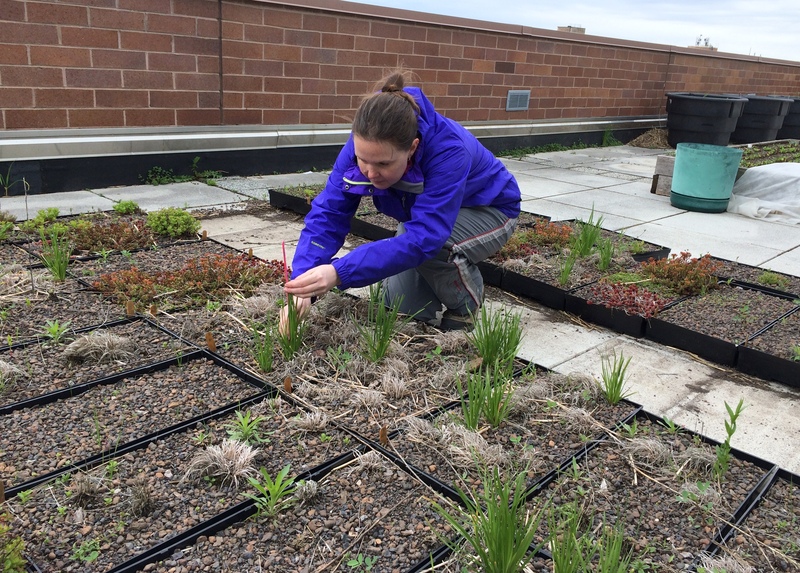 These vegetation surveys allow me to measure the height, coverage and reproduction ability of the various plants that I planted on the green roof. With the rainy summer we’ve been having in Chicago, most of the plants are doing quite well and my little plots continue to look like mini-prairies. Originally, August was supposed to be the last time that I had to take these measurements. But my mini-prairies are looking so good (and I’m such a botanist!) that I want to come back next year and measure them again. We’ll see if that’s still the plan come 2016. Funny hat? Socks hiked up over my pant legs? It must be time for data collection in the prairie! 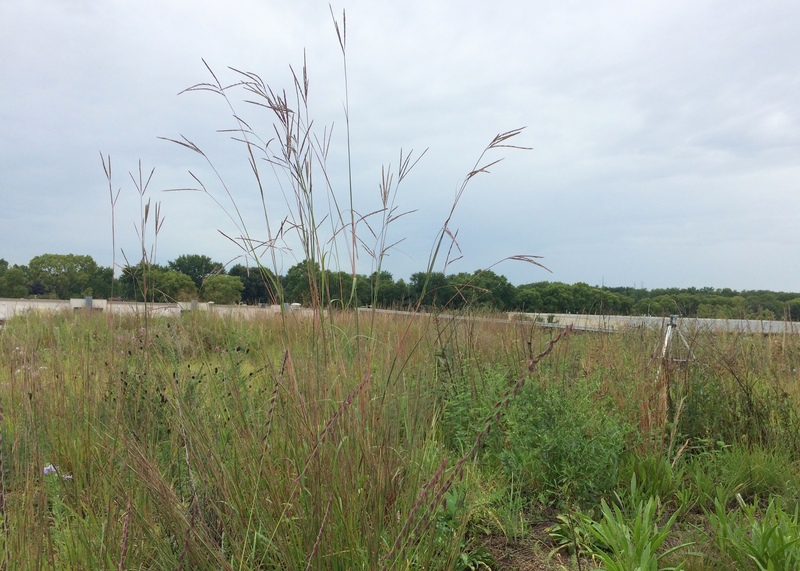 Speaking of prairies, I also visited an actual prairie for my research (on the ground this time, as opposed to a rooftop). 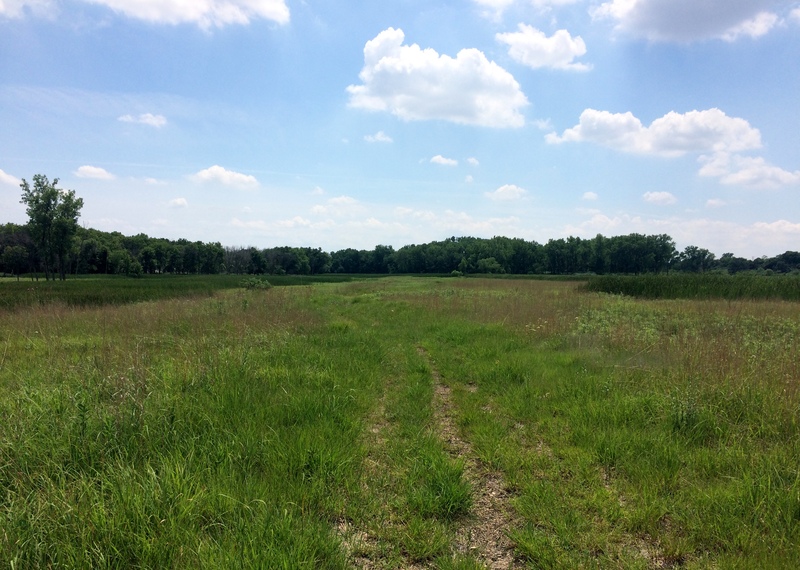 Two interns from the Chicago Botanic Garden and I took a trip to a large prairie in central Illinois to collect leaf tissue from the same species of plant that I’m studying on the roofs. 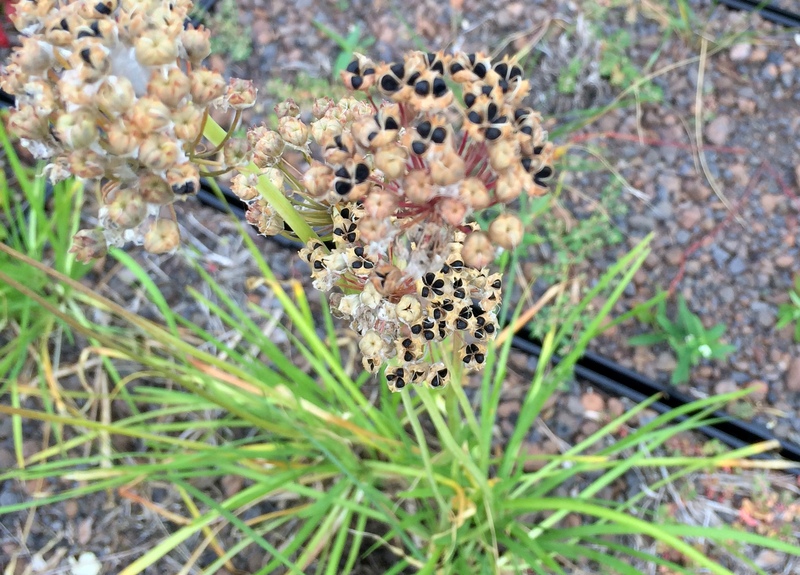 I am looking at how pollen movement in this species can help increase the genetic diversity of green roof populations. But I wanted to know what the genetic diversity of this species is like in natural populations, in real prairies. So we collected leaf tissue from a natural population, extracted the DNA from the leaf cells, and are now working in the lab to measure the diversity. This is a work in progress, so stay tuned for the results. 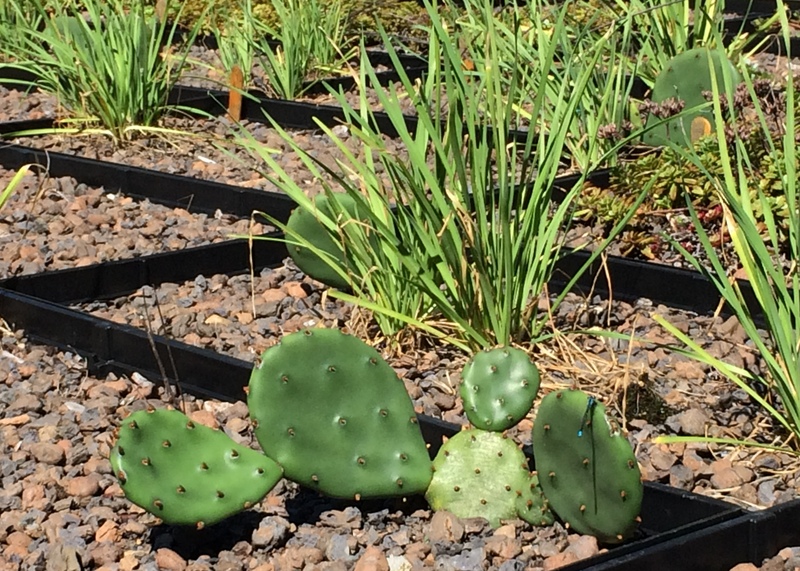 If anything, it was neat to see the plant species I’m working with in its natural habitat. 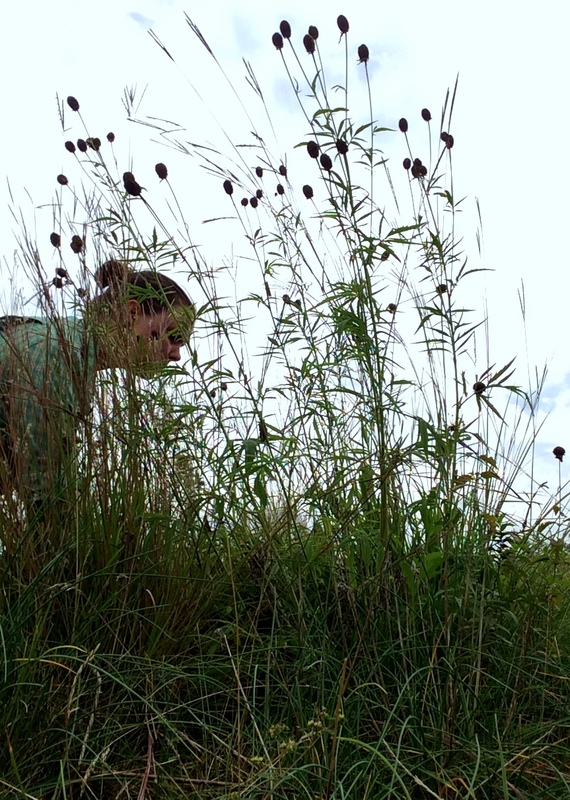 Interns from the Chicago Botanic Garden help me collect leaf samples from the natural prairie population. In addition to collecting lots of data, I was also fortunate to be asked to present some of the overall findings of my research so far. 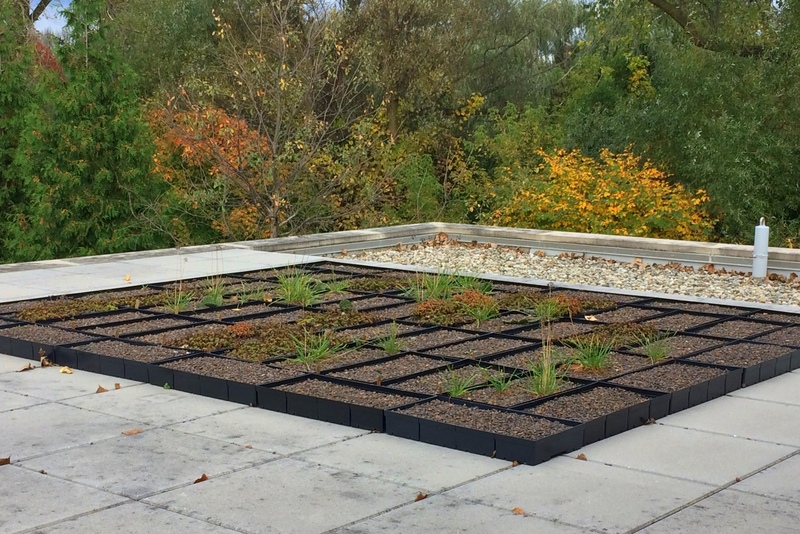 I’m still working on collecting some more data from internet sources and analyzing my results but I am beginning to find some trends with the data that I collected back on the green roofs in Germany in 2013. 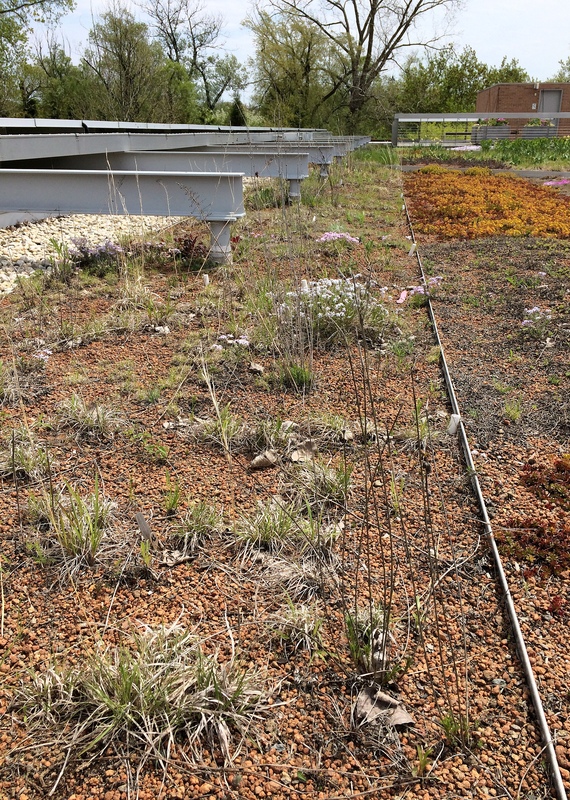 It seems like there are very few patterns that predict which plant species colonize green roofs and survive on them over time. It looks like each green roof is a unique place with its own community of plants and animals that live there. I was able to share these results (and others) at a special green roof session of the Ecological Society of America’s annual meeting in Baltimore, MD. And not only did I get to present my research, but I got to attend lectures and workshops where I learned about other people’s research too. 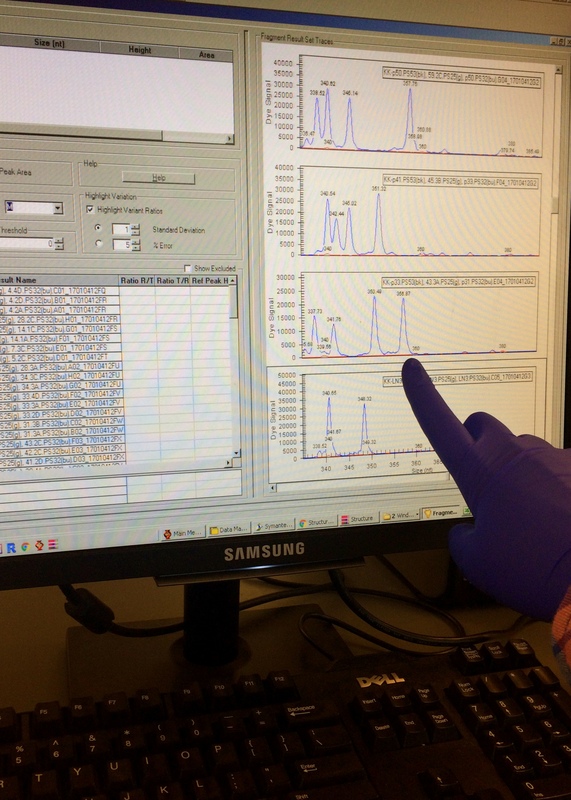 It was a busy week in Baltimore and even though I came back tired, I was also inspired and excited to keep making discoveries with my own research. 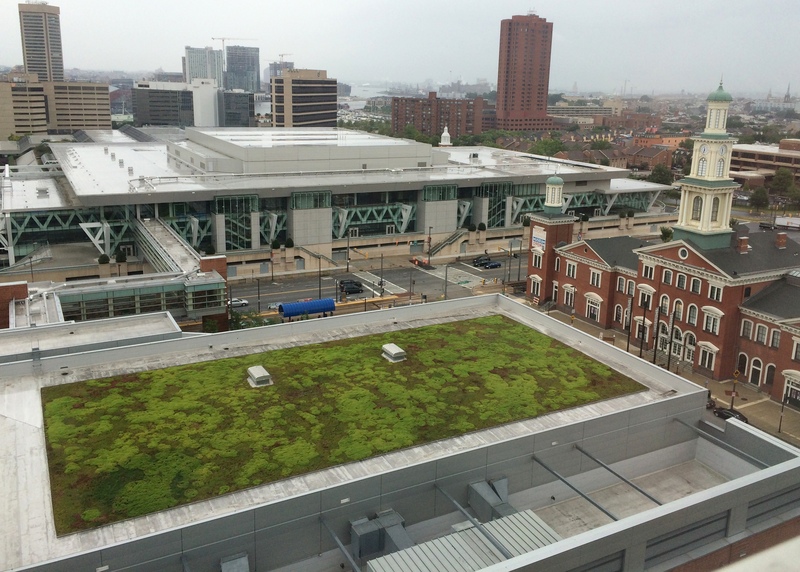 The hotel at the Baltimore Convention Center had a green roof. A great inspiration view as I prepared to give a presentation about my green roof research at the ESA conference. 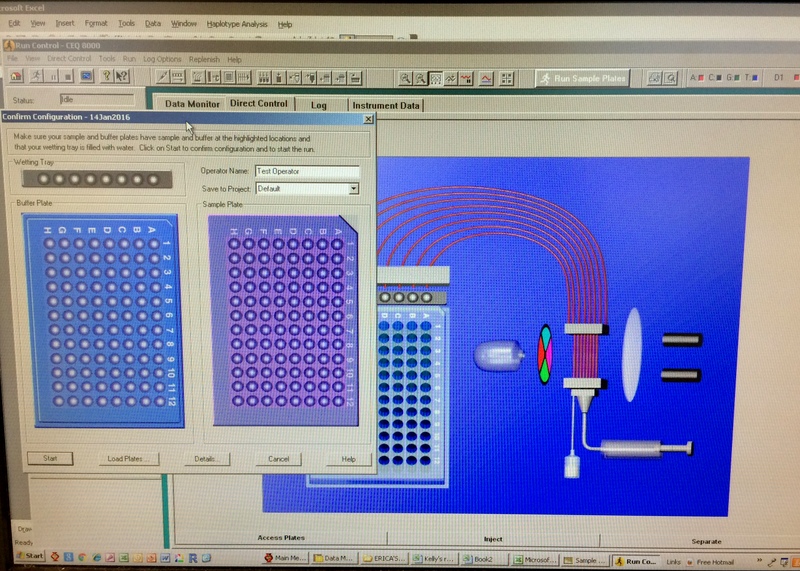 And finally, in August I started to work in the lab again to continue work that I’ve been doing for about a year now. The lab was super busy with summer interns but toward the end of the month things quieted down a bit and I could claim some work space back. I’m ready to continue the work I was doing back in the spring. It’s time to find out if I can determine the father plants of all the seeds that I collected last fall and grew up into little seedlings over the winter. It’s going to be a lot of work but I’m looking forward to being a bit of a botanical detective!